ceramic heaters including its recently introduced positive pressure low intensity tube heaters with its patent-pending Innovative Tube Integrity Safety System(TM) (TISS) for the ultimate in fire safety protection at the 2010 AHR Expo®, January 25-27, 2010, Booth #1410 at the Orange County Convention Center in Orlando, FL. display the latest HVAC&R systems, equipment, components, related products and services. The first U.S. manufacturer to design unitized tube heaters, Space-Ray will celebrate its 61 years of field experience and exposure to industrial heating and commercial heating problems at AHR Expo 2010. In 2009, Space-Ray celebrated its 60th Anniversary since it manufactured its original gas-fired burner, entering the business in 1949. "With over 400 different heating configurations in 80 different models in both natural and propane gas, Space-Ray has one of the broadest and most complete infrared product lines in the industrial heating market with radiant efficiencies unsurpassed by competitive systems," noted Bob Genisol, Vice President of Space-Ray Infrared Heaters. 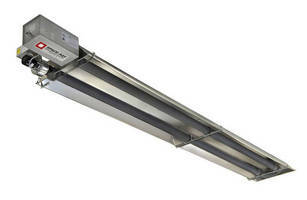 "Capacities range from 20,000 to 250,000 BTU/Hr with minimum mounting heights of 10 to 18 feet. All model heaters manufactured by Space-Ray are CSA-Certified. Our broad capabilities enhance our ability to custom design a radiant heating system that meets precise facility requirements for optimum flexibility, economy and maximum radiant energy distribution." from 40,000 BTU/Hr to 200,000 BTU/Hr and minimum mounting heights of from 10 to 18 feet. LTS Series infrared straight Tube Heaters with its more than 100 configurations and heating capacities ranging from 40,000 BTU/hr to 250,000 BTU/hr. 19 ETS/ETU Series Low Intensity Infrared Tube Heaters with 100 configurations and capacities ranging from 40,000 to 250,000 BTU/hr. Ceramic Heaters ranging in capacity from 26,000 to 160,000 BTU/hr. enhance safety for building owners and give them peace of mind. The heater line is ideal for retrofitting existing push through systems and is certified for vented (sidewall or through the roof venting) or indirect vented operations, depending on application requirements. CSA-Certified, the PTS/PTU tube heaters come in natural or propane gas and use positive pressure to push products of combustion through the heavy-duty calorized aluminized or Alumi-therm steel combustion chamber. According to Space-Ray, the TISS(TM) System is a low voltage circuit that continuously monitors the clearance between the top of the reflector and the ceiling for excessive heat and tube integrity compromise. If the heat increases due to the unlikely event of heat exchanger failure, the wire melts, the safety circuit is broken and the gas controls shut down, the company said. "With the availability of this positive pressure system, we have taken steps to assure the integrity of the system and provide the ultimate in fire safety protection for our positive pressure radiant tube heaters," noted Genisol. "We wanted a system that was safer than any positive pressure heater on the market." The PTS/PTU heaters come in a choice of one-stage or two-stage modulating input controls for added flexibility and a totally enclosed burner box that places all the power, thermostat and gas connection in one central location for easier installation and maintenance. By being fully enclosed, the noise level of the heaters is below 60 dB(A), making them ideal for applications where minimal noise is desired. Designed for use mainly in complete building heating, the PTS Series heaters are available in Straight, L-Shaped, Z-Shaped or expanded U-Shaped configurations. In contrast, the PTU Series heaters, designed to use for high heat loss areas and spot heating, are available in seven different "U" shaped configurations that assure uniform radiant heat energy distribution. Also available from Space-Ray at the AHR Expo 2010 will be information on Space-Ray's exclusive COMPUHEAT® program, a computerized heat loss analysis service, which the company offers free of charge to qualified plant managers, contractors and building owners. The first U.S. manufacturer to design unitized tube heaters, Space-Ray has over 61 years of field experience and exposure to industrial heating and commercial heating problems. Headquartered in Charlotte, North Carolina, Space-Ray's parent company Gas-Fired Products also has a wholly owned subsidiary in Ipswich, England.